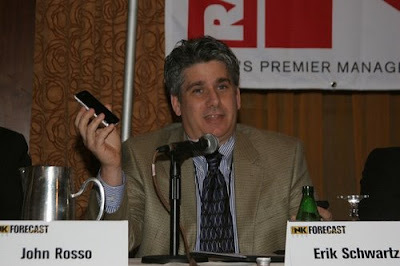 I was on a really terrific panel at Forecast 09 in New York last week (I snarfed the picture from Eric Rhodes' Radio Ink site). My fellow panelists and I had a spirited conversation about how new media fits in with the radio industry. Thanks to Eric Rhodes for organizing the conference and my fellow panelists; Gerrit Meier (COO, Clear Channel Online Music & Radio), Deborah Esayian (Co-President, Emmis Interactive), Bruce Falck (Director, Google Audio Ads), and John Rosso (Senior VP/Digital Media, Citadel Broadcasting).